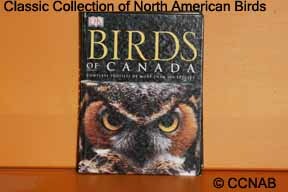 Excerpt from the Introduction of"Birds of Canada"
The incredible diversity of the avian population in Canada is evidenced by the more than 620 species of birds that are now accepted as having occured in Canada. These species can be found in a wide variety of habitats, from spectacular mountains ranges, vast grasslands, hot and cold deserts, deciduous and coniferous forests, swamps and pine forests, tundra, glaciers, and ice fields. Inhabiting this vast area are millions of individuals birds. Many birdwatchers practice their hobby close to their own backyards. They learn to recognize the species they see most often and occasionally identify a "new" species for the yard, perhaps even photograph the birds they see. Some are so passionate that they travel throughout Canada identifying as many species as they can, often covering many kilometers on short notice to observe vagrants. Not even the most ardent birder has seen all of the species that have been recorded in Canada. But that is part of the fun and challenge of birding. It holds something for every level of interest, and the amateur birder stands as much chance as the professional of making a discovery that sheds important light on the field of ornithology.